GOING ON VACATION? Don't get burned - come see us first. Most people save up all year for that one week in paradise. And we all know what that first day in the sun can mean - SUNBURN! By getting your base tan with us first you can enjoy every minute of your vacation without the risk of burning or looking like a ghost in your swimsuit. Vacations can cost thousands of dollars. A small investment with our salon will guarantee that you enjoy your vacation to the fullest. PrepareYou need to shower, shave and exfoliate at least 2 hours prior to arriving for your spray appointment. Wash your body with a "spray safe soap" - these soaps are Ivory, Irish Spring, Dial or Zest bar soaps.It is very important you use one of these simple bars of soap because if you do not, your results will be damaged. Soaps with lotions, mineral oil, or moisturizer in them will create a barrier on your skin and prevent the spray tan from properly sticking. Make sure you arrive to your appointment with bare/natural skin.You do not want make up, lotion, deodorant or any barriers on your skin!Bring loose fitted clothing with you to your appointment! Any rubbing on the skin can cause imperfections in your spray tan Please remove all and any jewelery and leave it at home! Aftercare Wait to shower for at least 12 hours, your tan will develop up to 24 hours.Showering before 12 hours can cause your spray to not take or fade very fast.Your first shower is a rinse. Wait till the water runs clear without using any soaps and jump out to air dry.You do not want to cause any mess-ups in this processes so it is very crucial you just rinse without shampooing, conditioning or washing. You can shower using soaps, shampoo and condition after that rinse.Wait at least 6 hours before this shower. Please note that the more you shower, shampoo and condition- the faster you will fade. Stay away from Dove and other soaps with a lot of oils. Ivory, Irish Spring, Dial and Zest are safe soaps.Refrain from any exfoliants, loofahs, facecloths or anything abrasive to the skinIf you use one, you will remove the spray tan.Make sure you moisturize as needed. We always recommend making an appointment for our Norvell Auto Revolution Spray Booth. Airbrush is by appointment only. Please be sure to make any manicure or pedicure appointments a day prior to your spray tan as well as any hair appointments that will require your hair to be washed or eye brow appointments. Any of these services can cause the skin to be exfoliated and damage your results. If you have any further questions-please feel free to call! Enjoy your sun-kissed glow!! 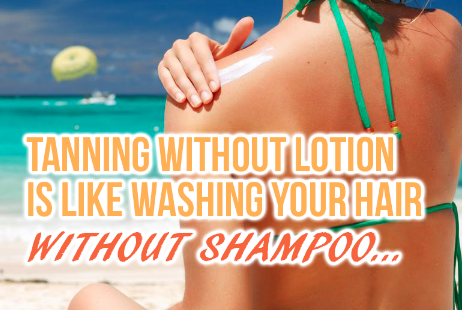 Did you know that tanning without lotion is like washing your hair without shampoo? So here's what you need to know....Moisturized skin reacts better to UV rays than dry skin to help your skin tan faster.Moisturized skin also keeps your tan longerKeeping your skin moisturized is also essential to maintaining healthy skinMoisturizing your skin also helps your skin keep its elasticity and will help prevent you from aging fasterThe healthier and more moisturized your skin is the more even your tanning results will be Tanning lotion is specifically formulated with ingredients that will help enhance your tanning experience Tanning lotions are categorized as following; Bronzers which can help you adhere a base tan and have added color and fall into the category immediate or delayed bronzers. Some bronzers are very dark and can give you a tan beyond your natural ability to bronze. Maximizers which help you adhere a base tan without the added color and gives you a very natual sun kissed glow. Intensifiers which work with your melanin to help you achieve a darker but natural color without the use of added color.Coolants which work like a maximizer while tanning but give you a cool and refreshed feeling and also helps cool your skin faster after tanning to help stop the tanning process after and can be hydrating and repair agent for the skin. Tingles stimulate your skin and use ingredients that promotes micro-circulation. Micro-circulation brings blood to the surface of your skin, making it easier for it to become oxygenated which helps the UV rays be able to penetrate the skin easier and help your tan reach a new level and give you an amazing glow. Using tingles does come with some side effects that everyone should be aware of like; mild to intense tingling of the skin, slight to intense reddening of the skin, mild to intense heat on the surface of the skin. TINGLES ARE NEVER TO BE USED ON YOUR FACE! Your skin is much too thin and it will cause damage.There are face lotions specifically formulated to be used for the face, make sure you take of your skin and avoid using other lotions on your face!Mixing of tanning lotions can help you achieve a better color, make sure you talk to one of our Smart Tan certified team-members at Sun in the City for any advice or opinions on tanning lotions!Also do not forget to moisturize once you are done your post tan shower and continue to apply more moisturizers as needed. *** WARNING-- lotions bought online are not always certified from the brand that is printed on the bottle and may have been tampered with. PLEASE buy your lotions from an official and certified salon! Also, tanning oils and many brands are not safe to be used in indoor tanning beds, such as Australian Gold. 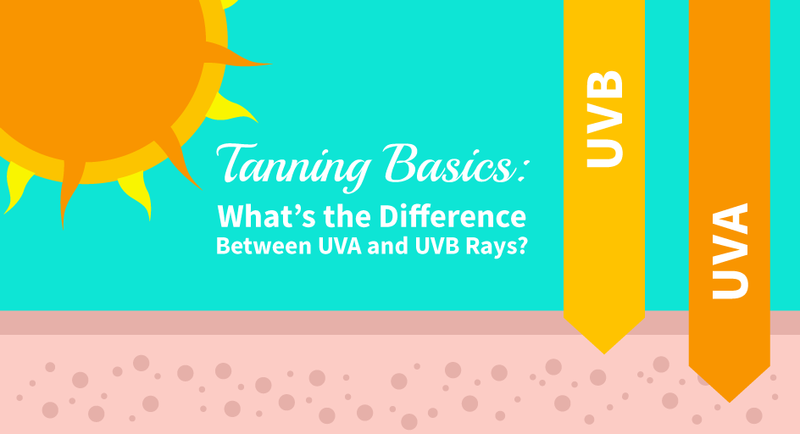 uvB rays​:UVB rays are also known as the "building" rays or "reddening" rays. These rays are responsible for increasing the production of melanin in your skin. The more melanin you have, the darker the pigments of your skin will become. Along with building up the melanin, these rays also build up your vitamin D levels. UVB rays are great for building your base tan but they can also burn you if you don't start off slow with lower minutes. UVA RAYS UVA rays are also known as "bronzing" rays. These rays penetrate deeper than UVB rays, reaching layers deeper into the epidermis. 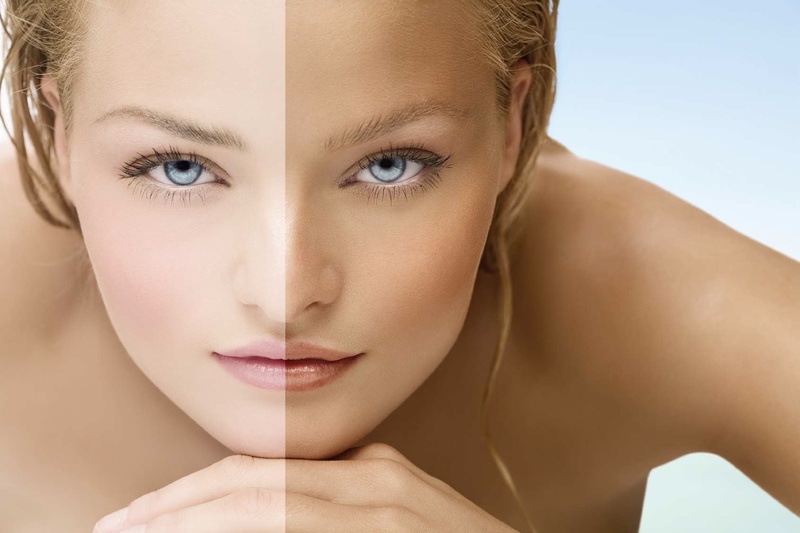 UVA rays oxidize the melanin in your skin, creating the bronzed or brown look to your tan. Although theses rays typically don't cause burns, overexposure to the rays too quickly can cause you to burn. UVA rays are best if you have a decent base tan already. matrix - high pressure tan. 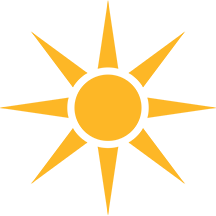 Sun in the City has been helping the residents of Leominster, Fitchburg, Lunenburg and Sterling its surrounding communities of Central Massachusetts look and feel amazing. We pride ourselves on the cleanliness of our beds and rooms, our friendly well trained staff, and providing a comfortable relaxing environment for everyone that visits. We are an upscale tanning salon giving our guests the best in tanning & lotion products. Proudly tanning you since 2004 and repeatedly voted #1 Tanning Salon.